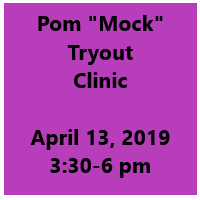 COME GET READY FOR TRYOUTS!!!! PROFESSIONAL FEEDBACK @ THE VARSITY AND JV LEVEL INNOVATIVE CHOREOGRAPHY! LEARN THE PROCESS OF AN AUDITION...AND BE READY!!! Call 303-770-4480, or Email starstruck@saodance.com if you have questions. Cost: $30 per Session (Payment in Full to reserve spot!) Register online in your portal or call the front desk during office hours.